1 box of dehydrated hash brown potatoes (the kind you soak in hot water). You can also shred red skin potatoes. Wash and leave the skins on. Shred enough to layer the bottom of a 12-inch fry pan. 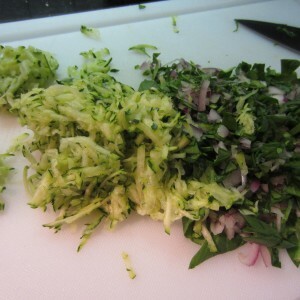 Start by prepping the garlic, tomatoes, zucchini, onion and spinach leaves. Follow the directions on the box of dehydrated hash brown. If using red skin potatoes, shred and set aside with the other prepped ingredients. 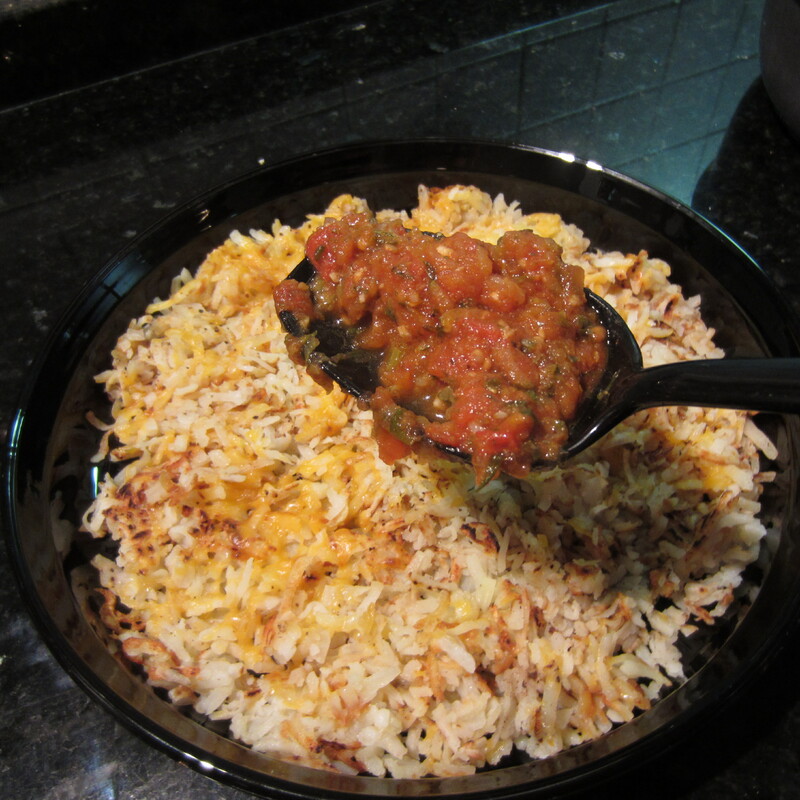 Add olive oil to a 12-inch fry pan, heat the oil and the shredded hash browns. Cooked until crispy and brown on the outside. Add the cheddar cheese allowing it to melt. Salt and pepper to taste. 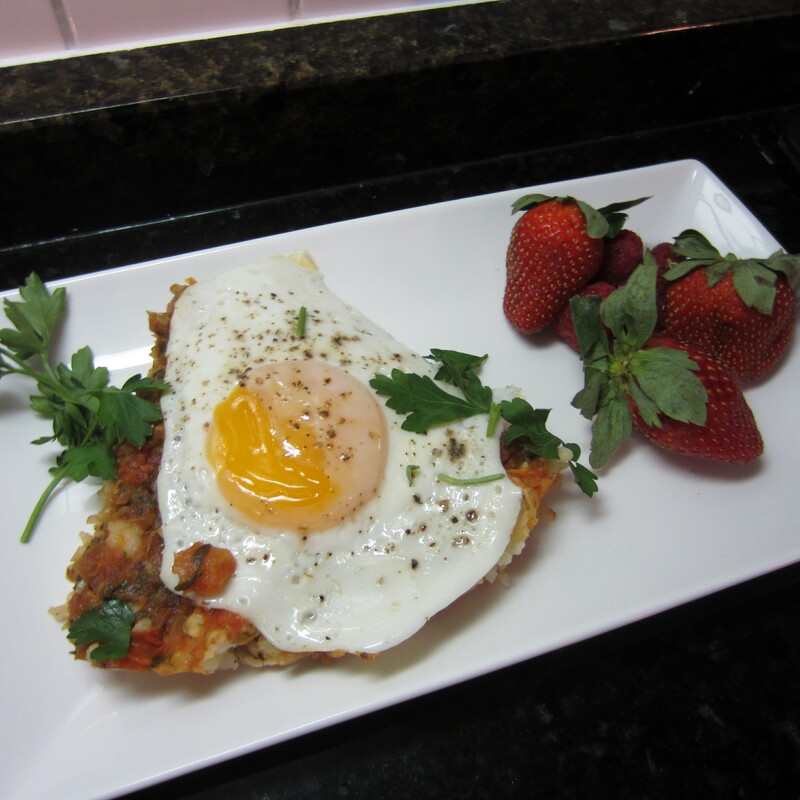 Remove potatoes from the skillet and place in a quiche type casserole dish. The dish should be large enough to display four cooked eggs. Set the cooked potatoes aside. Using the same skillet (add more olive oil if needed), add onion, spinach, zucchini and garlic. Cook for 4 minutes over medium heat, stirring occasionally. Add chopped tomatoes and seasonings. Cover and cook over low heat for 5 minutes. Remove cover and using a potato masher, break down the tomatoes. Cover pan and cook an additional 5 minutes. 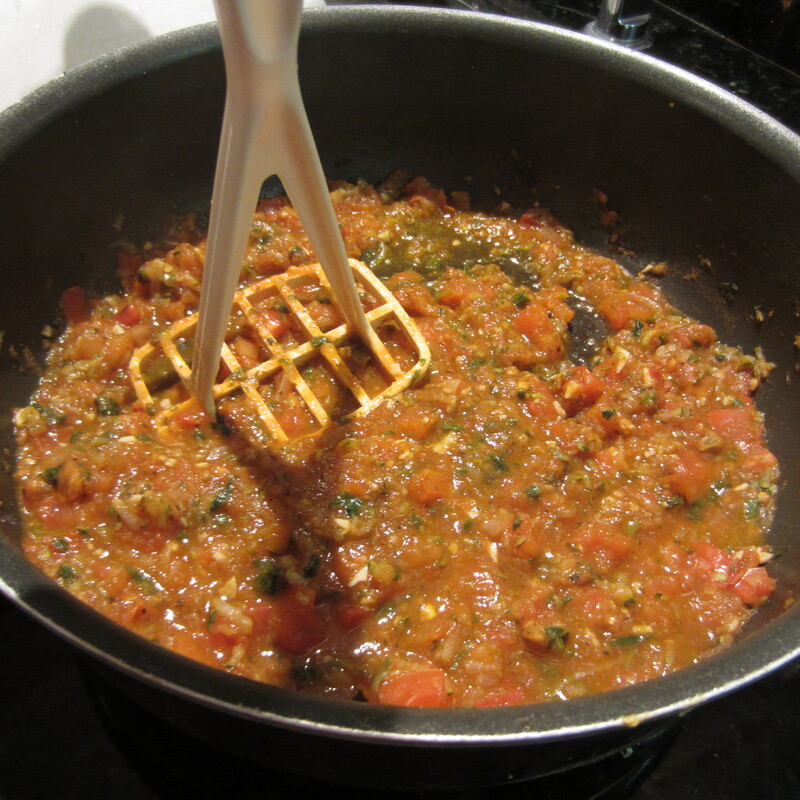 Optional: you can add a tablespoon of tomato paste to the tomato mixture to thicken. I did not find it necessary. 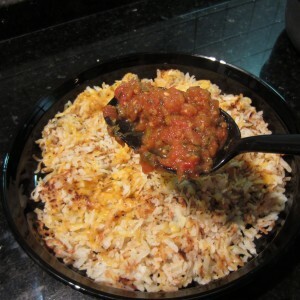 Remove tomato mixture from heat and evenly spread on top of cooked potatoes. Chopped a handful of fresh parsley and set aside. Time for the eggs. Cook the eggs over easy. Salt and pepper to taste. 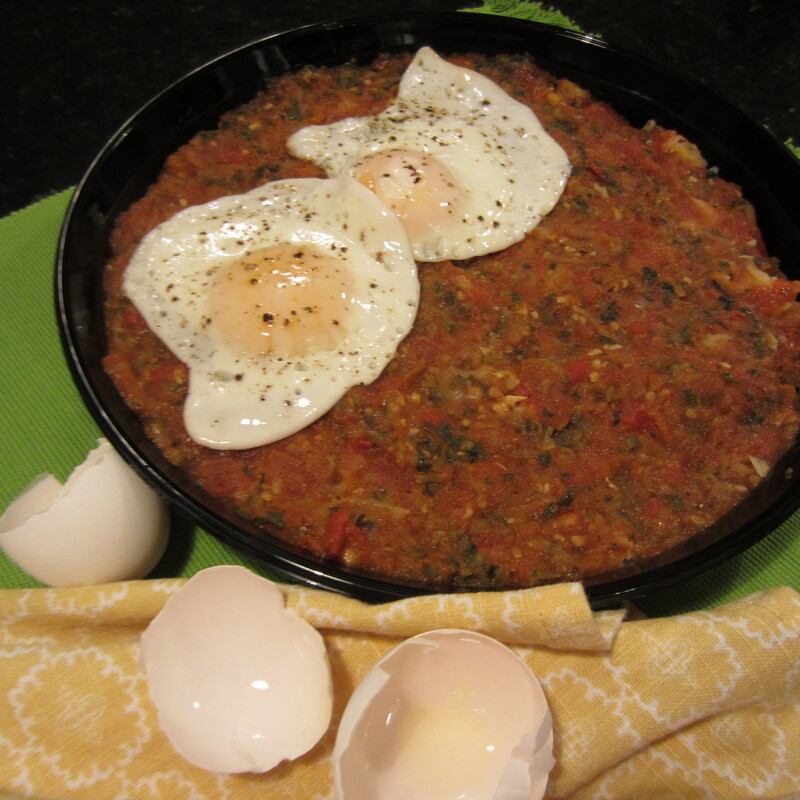 Position cooked eggs on top of the tomato mixture to make four equal servings. 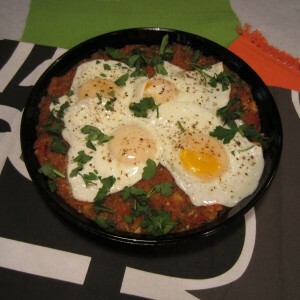 Once eggs are in place, sprinkle with the chopped parsley. 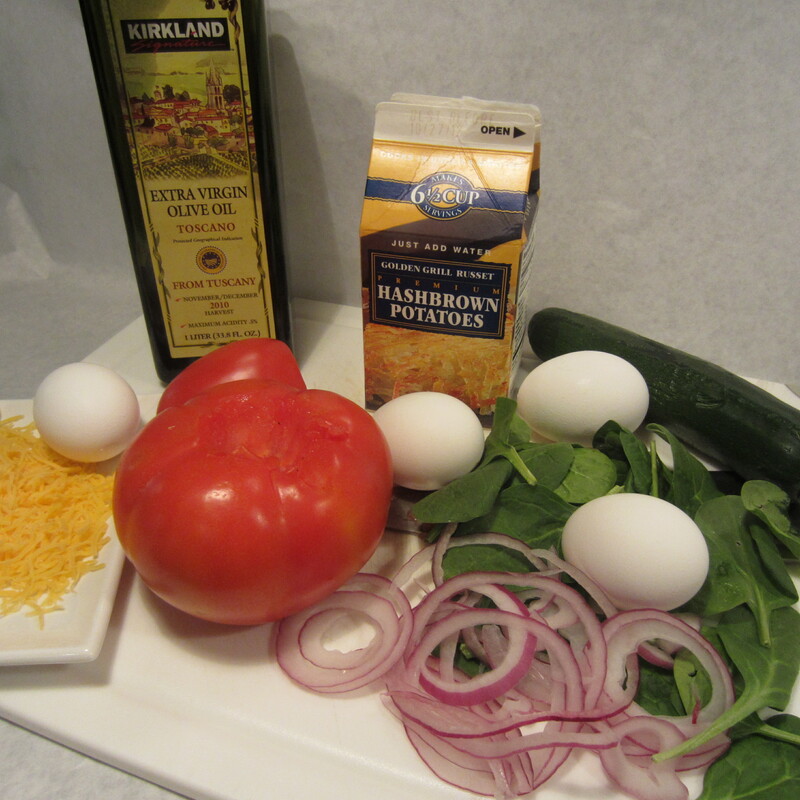 A side of pita bread with hummus or fresh fruit complements this dish. If not serving immediately, cover the dish with a glass lid or saran wrap. Do not use aluminum foil as the foil will cause the eggs to discolor due to the formation of aluminum salts (It’s a chemistry thing). The eggs are still perfectly safe to eat, but they won’t look so pretty. So, fore-go foil. Let’s talk calories. This dish serves four. Each serving is in the neighborhood of 270 calories. If serving with pita bread, hummus or fruit, the calorie intake increases. When reheating in a microwave, cover with paper towel. Heat in 15 second bursts until heated through.